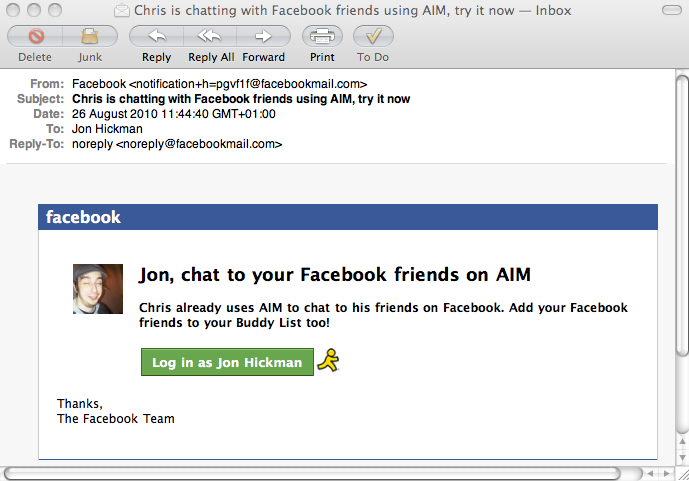 Now I’ve mentioned that to Chris, and it’s not something that he asked Facebook to send out for him; point of fact he doesn’t use AIM for Facebook chat. So that’s a bit weird then. It’s also a bit clever of Facebook. The more time I spend on Facebook, the better that is for Facebook – I might click on an advert or something, and clock up a few more pennies in their bank. I don’t use chat at all, so that’s a way they could get me to use the service more. If I were to use Chat, and use AIM to do it, I’m guessing that would be a way to hook messenger friends neatly into Facebook, connecting a few nodes of my social graph, shortening some things in Facebook’s favour – they might get a few more members, some more page impressions, etc. Automatically sending out a message that links this activity to a Facebook friend provides some authenticity, and adds a certain cense of urgency and appropriateness to the task that Facebook want me to do – “Hey Chris is cool, right? He’s doing this – we’re not telling you to do it, Chris is!”. That’s a neat example of the way in which Facebook members are a form of labour, employed by the network, to help gain advantages for them. Chris is actually being used to generate capital for them. He gets a pay off – playing Farmville or whatever he does on there – but in doing so our connection can be exploited by Facebook. The really clever thing is that they chose Chris as the front man for this. You see the strange thing is, Chris and I don’t talk on Facebook. Could that be why he was used? Now I concur that it may have been a random match, but think about it: I trust Chris enough to be friends with him on Facebook, but I don’t talk to him much on Facebook, therefore, based purely on our Facebook activity, I’m unlikely to be able to validate that the message is genuine. That means that Chris is unlikely to know that his identity is being used within this exchange, and he’ll sleep walk through the whole thing. That would sound pretty neat, particularly if you’re a company that has a user base which is a bit twitchy about privacy right now. But here’s the problem. If Facebook’s algorithms have matched Chris and me in the way outlined above then it’s a gambit that shows a lack of regard for the other ways in which people connect. As far as Facebook is concerned, we’re not very close, but in fact our connection is active in so many other fora e.g., Twitter, email, classes, tutorials. The world isn’t polarised neatly, but I can see how when you’re working in a corporate silo, or focussed purely on code and people, you might not be able to see that bigger picture. As I say, it may have been a random pairing, but it’s a useful thought experiment. If you’ve had any similar emails, do let me know in the comments. This idea of social networking as labour is an interesting one, because there is no question that Chris’s activities (real or imagined) are being exploited for capital gain by the corporation of Facebook. But by the same token, all that Farmville he’s been playing (hypothetically) is not something that he experiences as work. In fact, despite commercial exploitation of his activity in aggregate, it’s interpreted as a voluntary leisure activity.The problem here though, is not about whether his online activity is being exploited in a new Matrix-y capacity that we can bring a Marxist critique to bear on, but rather about his identity and image forming the basis for direct marketing without his permission.When you compound that with an outright lie (or a factual error – let’s allow that possibility) on Facebook’s part, it’s grounds for getting seriously cross.